On the opposite bank of the Tiber lies the most fun and picturesque popular neighbourhood of Rome. It is a perfect area to wander through the maze of narrow streets and charming houses. 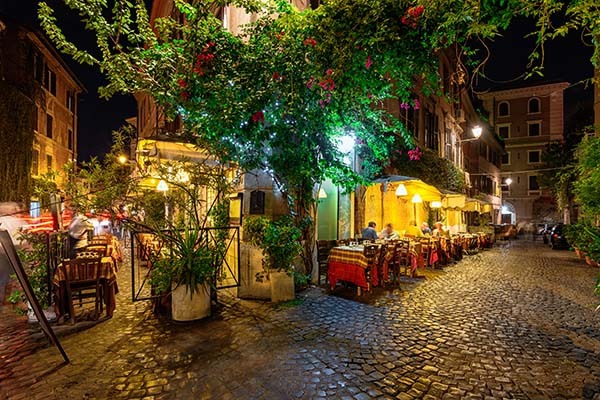 At night it is the liveliest neighbourhood in Rome. Metro Trastevere cannot be conveniently reached by metro. It is best to travel there by bus, for instance using line 116. 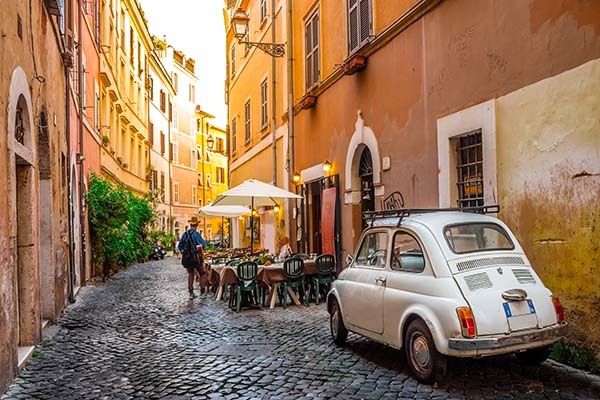 Located on the opposite bank of the river Tiber, south of the Vatican, is the picturesque neighbourhood Trastevere. The name Trastevere is derived from Latin, trans Tiberium; ‘beyond the Tiber’. This old working-class neighbourhood with its narrow alleyways and medieval houses is a particularly lively affair at night – thanks to the many tourists – with lots of restaurants, trattorias and pizzerias. 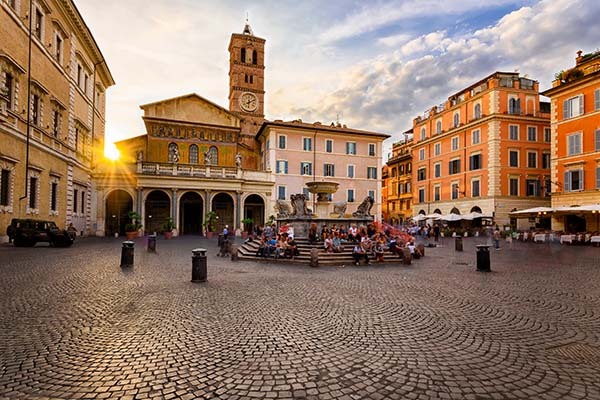 Visit this truly Italian neighbourhood of Rome for a lovely stroll or relax on one of the many café terraces. As far back as the days of emperor Augustus, Trastevere has been one of the city's 14 districts, and it was also walled. Several important Romans built villas in this neighbourhood, including Julius Caesar. The charming ambience of the neighbourhood with its maze of many narrow and winding streets comes from medieval times. Piazzi di Santa Maria in Trastevere is the beating heart of the neighbourhood. This square with the church of the same name and a fountain is a meeting place for the trasteverini. At night the area around this square is the main entertainment area in Rome. 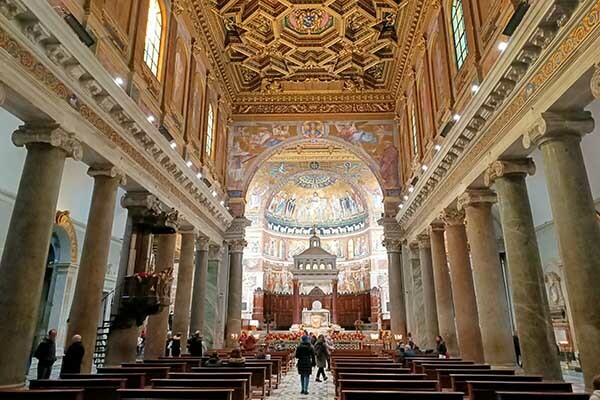 The Basilica Santa Maria in Trastevere: This basilica is the oldest Marian church in Rome and the main attraction of the neighbourhood. After several restorations, the basilica has retained its medieval character, in part thanks to the many authentic mosaics. 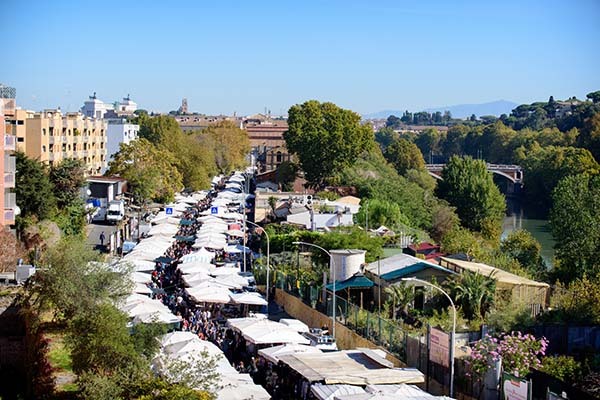 Every Sunday morning until 2 pm, Rome's most popular flea market is held at the Porta Portese, around the streets Via Portuense and Via Ippolito Nievo. It sells everything from antiques to clothing. Villa Farnesina: A lovely 16th-century mansion with works by Raphael and Peruzzi surrounded by symmetrical gardens. The mansion looks fairly modest from the outside, but is wonderfully decorated on the inside in Renaissance style. 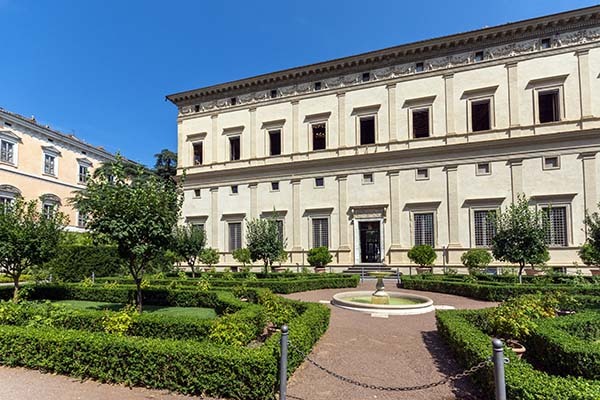 The villa is one the gems of Rome that is not yet overrun by tourists. Address: Via della Lungara 230. Open daily from 9 am to 2 pm, admission 6 euros. More info. 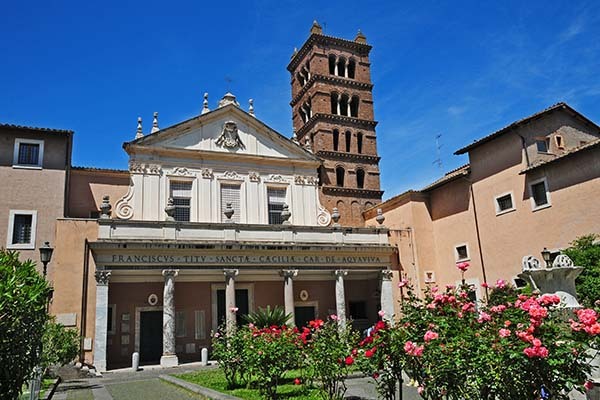 The Basilica of Santa Cecilia in Trastevere: The other basilica, dedicated to Saint Cecilia, patron saint of music, is one of the oldest churches in Rome. Here you can find 13th-century frescos by Pietro Cavallini. Colle de Gianicolo: This hill is located next to the neighbourhood of Trastevere and if you have the time and energy, the tough hike up the hill is worth the effort for the great view of Rome you will have. At the foot of the hill, you will find the Fontana dell’Acqua Paola; this beautiful fountain played an important role in the film ‘La Grande Bellezza’. 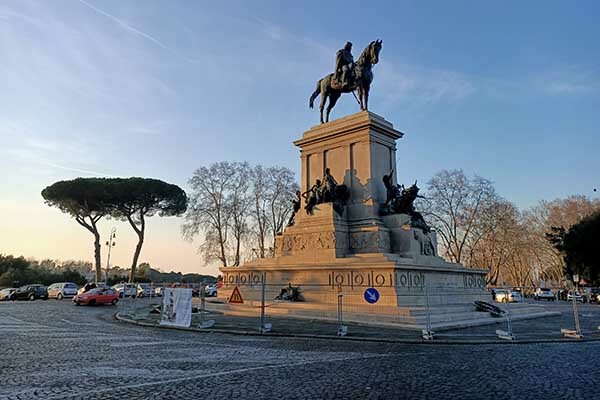 Once you reach the top of the hill, you will find a park with the statue of freedom fighter Giuseppe Garibaldi on horse-back, where a cannon is fired at noon every day. You can then descent the hill on the other side, which will take you in the direction of the Vatican. 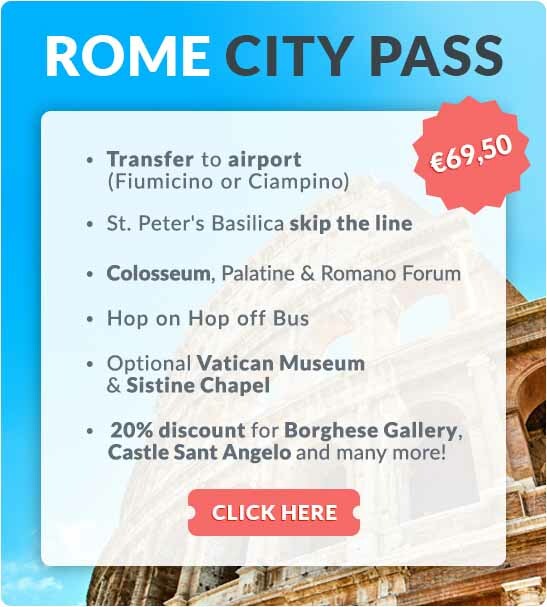 Where is the Trastevere neighborhood located in Rome?